Are smart phones ruining the restaurant experience? Nicholas Carr briefly described the effect of the internet on the way we experience actual performances as well as the recordings of those performances (Carr, 96). Since the introduction of the internet, and most recently the growth of social networking platforms there has been a cultural shift on how we engage and communicate. Media companies, businesses and organizations are continuing to adapt and cater to new expectations. However some businesses are going against the grain and standing up to consumers. 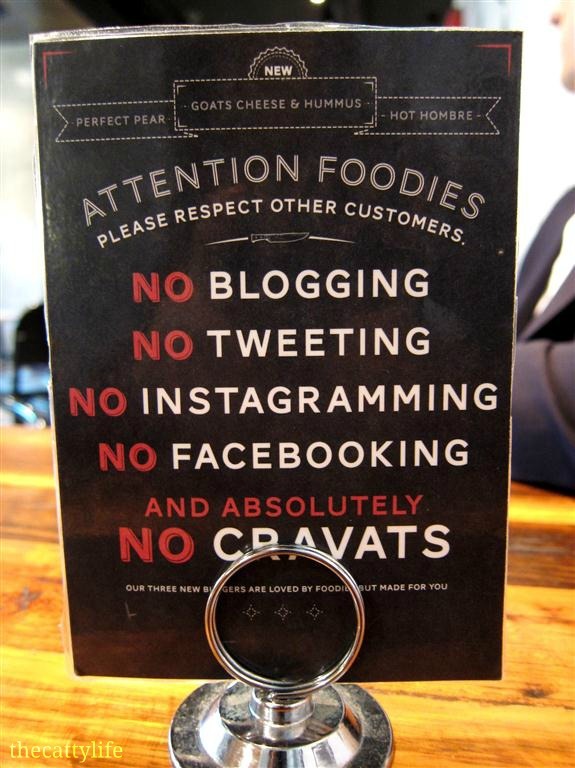 A New York restaurant is claiming that cell phones are slowing down service. Wait times have doubled because customers are too busy taking pictures of their meal, posting it on Facebook, Twitter and Instagram. This prompted some restaurants such as Bucato to ban cell phone usage in the dining area. Other restaurants such as Sneaky’s Chicken are proposing a different strategy. Customers who willingly surrender their phones receive a 10% discount on the bill on select evenings. The internet has begun to alter the way we experience every day activities. Nicholas Carr recognized the impact, and I wholeheartedly agree. In a world where technology is rapidly advancing, and affects so much of our daily routine, do you think banning cell phones is a good idea? Are we too far removed from the days of connecting with one another, and having meaningful conversations and interactions without being distracted by the internet? Where do we draw the line?